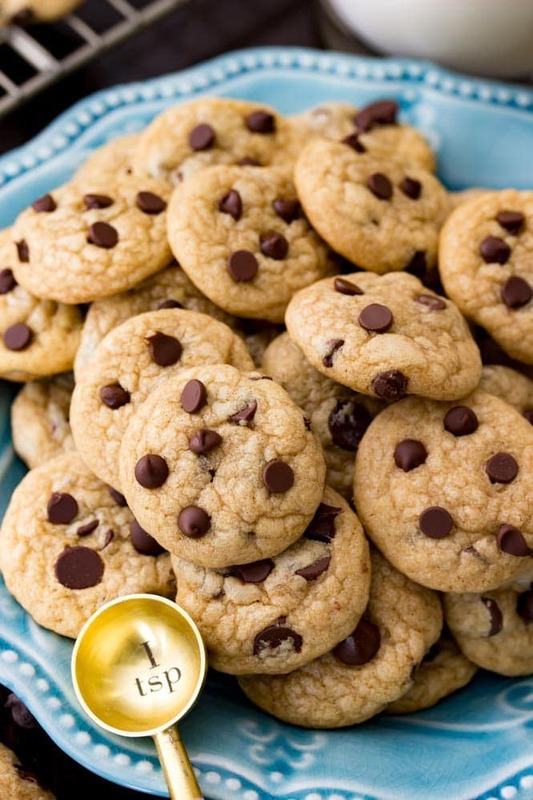 These mini chocolate chip cookies are each made with just a teaspoon and a half of dough for tiny, one-bite, 35 calorie cookies! 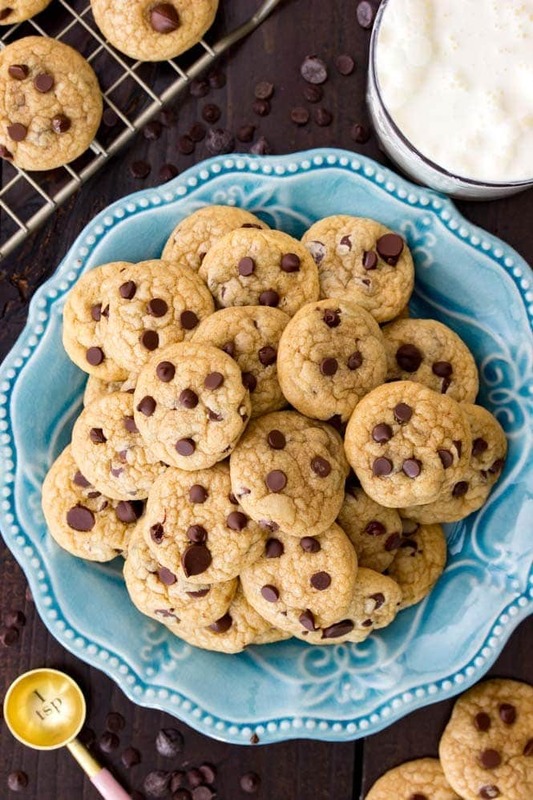 These are soft and chewy cookies that are great for portion control to not ruin your New Year’s resolutions! Happy 2018! I hope that everyone had a great Christmas and New Year! I took a little time off to spend time with the family and eat lots of Christmas cookies and other good food, and while I didn’t post much other than this cookie dough dip, I worked a lot behind-the-scenes on video and perfecting a few other upcoming recipes. These mini chocolate chip cookies were one such recipe that needed a bit of perfecting, and after a little bit of trial and error, I’m excited to share them with you! January is always a slower month around here because so many people ditch the sugar and resolve to eat healthier foods (myself included!). While I don’t really do health foods on the blog, I did want to offer a treat that wouldn’t wreck anyone’s resolutions, but still stayed true to the sugar aspect that’s at my core. And while I already have a very popular chocolate chip cookie recipe on the blog, this particular recipe has been perfected to be miniaturized. When you’re making cookies this small, a little bit of dough goes a long way. While you don’t necessarily need a special cookie dough scoop for these cookies, having the right one will make the job of scooping them much easier (and this recipe makes 70 cookies, so that’s a lot of scooping!). I used this cookie scoop that I ordered off of Amazon (affiliate). 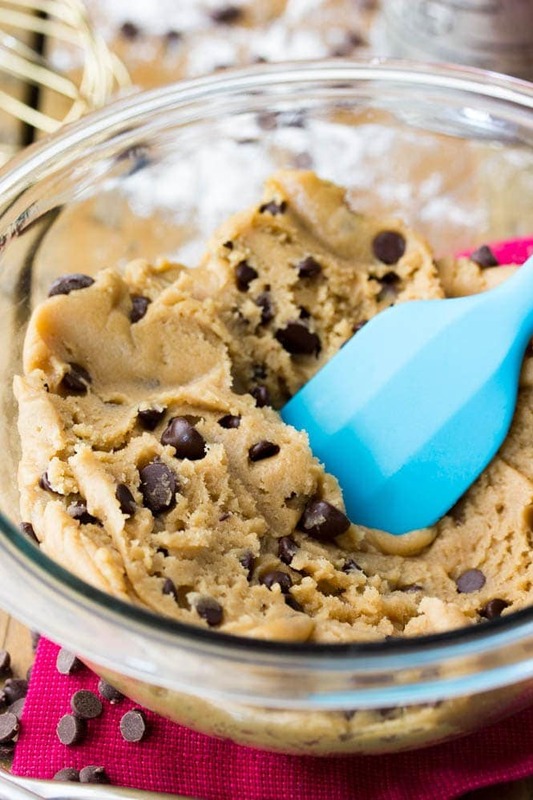 It’s a 1 1/2 teaspoon sized scoop (1/2 Tablespoon), which is exactly the size that you need for this recipe and it makes the scooping process really quick rather than spooning the cookie dough or using a larger scoop and trying to make all of your cookie dough balls even. I found that baking these cookies at 350F cooked them far too quickly and made them too hard, so I recommend baking these at 325F, which is not a temperature that I typically use on my oven but worked perfectly for baking these miniature chocolate chip cookies. 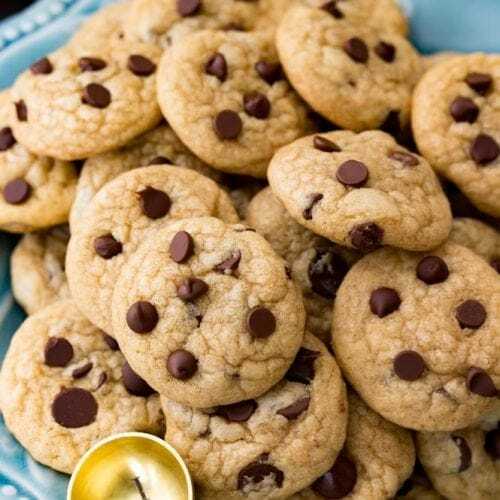 While the recipe calls for mini chocolate chips, I tossed in a few regular-sized semisweet as well, but I don’t recommend using only the standard size — the mini chips distribute really well throughout the cookies without overwhelming them. Preheat oven to 325F (160C) and prepare cookie sheets by lining with parchment paper. Combine butter and sugars in a large bowl. Stir well. Add egg and vanilla extract. Stir to combine and set aside. 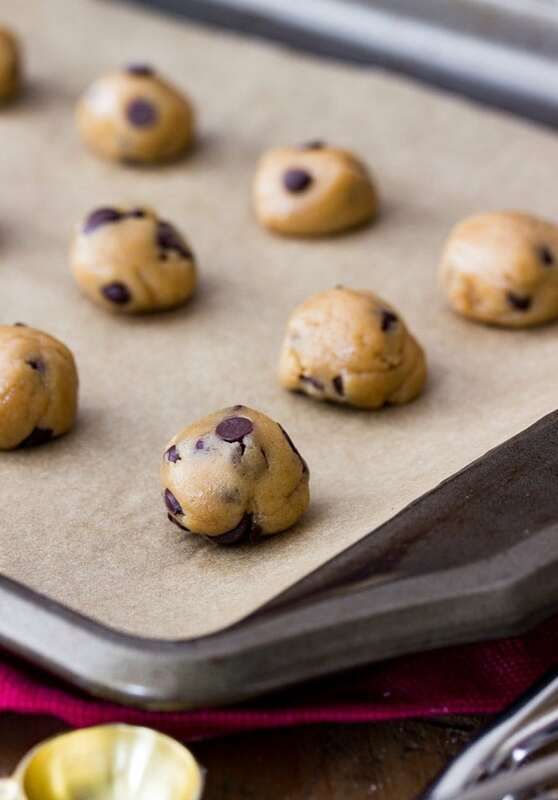 Scoop dough by rounded 1 1/2 teaspoon onto prepared cookie sheets, placing at least 1″ apart. I like to roll my cookies into balls after scooping them so that they bake very uniform and round, but this is not necessary. 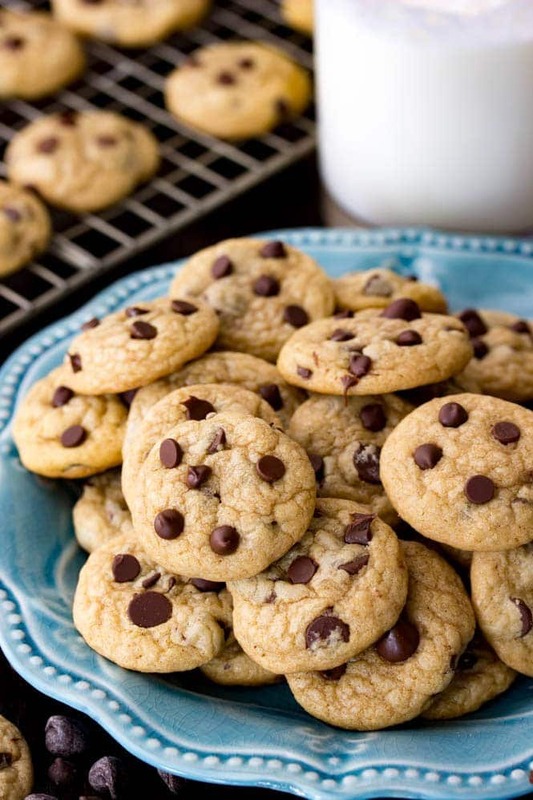 Bake on 325F (160C) for 6-8 minutes — cookies may still seem slightly soft in the centers, that is OK, they will cook completely on the cookie sheets. Don’t over-bake or your cookies will be too hard. These cookies were really bland! Can I add more sugar? Hi Mary! Sure, it would kinda defeat the low calorie purpose though so just keep that in mind. Ten Stars! I plan to make cupcakes for the grade-schoolers at church and do a Cookie Monster decoration. Of course, I needed small cookies for his mouth, preferably chocolate chip. The ones you buy at the store are rock-hard; I was too lazy to go to the store anyway; and I have ingredients in the pantry. I remembered you posted a recipe for mini-chocolate chip cookies so I whipped up a batch. They’re so easy and so cute, can’t wait for the kiddies to get their treat. Thanks, Sam for providing this recipe. I would not have known where to start. You did all the testing and my mini-cookies are perfect.